With the hottest midrange phones in Nigeria being promoted by the various vendors, buyers are face with a confused choice with regards to the best phones to buy in 2015. In this unique review, we will break down the technical jargons and present a clear review of the 3 most selling phones viz Tecno J7 Boom vs Innjoo Fire vs Infinix Zero 2. This review of the best midrange phones will guide you in making your choice according the way you use your phone before you buy the phone . 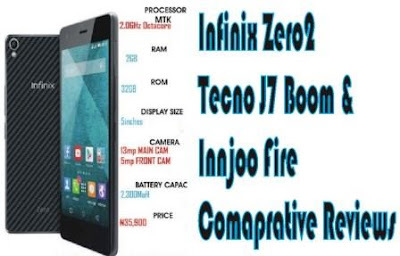 Naturally the first point of interest would be the relative lower resolution of Innjoo Fire but before you start throwing the punches look at the price, however before then, remember that Infinix Hot had earlier came out with a low resolution at N16k price and according to reviews, users were complaining, now that they decided to beef up the resolution, the complaint now is on price. If you are willing to sacrifice the resolution difference for some cash, then the 540 x 960 resolution of Innjoo Fire should not deter you, but definitely, you will be missing the crisp display of Tecno J7 and the HD Amoled display of Infinix Zero 2. 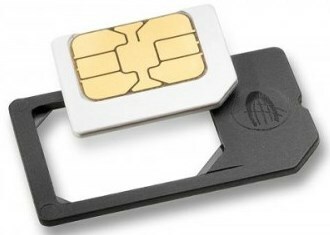 It seems the mini sim cards are gradually being phased out as phones are not favoring the Micro sims on both slots but not to worry, it not every time you may need to cut your sim, most network providers are now offering the 2-in-1 sim type as below or you can get an adapter. You would agree with me that Tecno really ‘fall hands’ in this one as regards the battery especially when promoting the phone as a musicbox which should be able to play your favorite music on speaker all day, it is even reported in reviews that the battery may actually be overrated at 2020mAH. If battery is top priority for you then Innjoo Fire is more preferred to fire up your phone for a longer time. Infinix’ battery is ok but considering the fact that you are powering an 8 – octa core device (compare to 4 – quad core of the other two) more juice will definitely be needed. The selfie addict would not forgive Tecno for the crappy 2.0MP on the front camera but if you don’t mind turning the phone around then you get great pictures at 8.0MP but then Infinix Zero 2 offers much more both front and back. But then, from experience and reviews, it is just a number because the Innjo Fire at 5.0Mp offers decent shots from its 5.0MP camera and compare to other phones of the same pixels, it is very ok (compare with Samsung below). It is reported from reviews that Tecno camera has no auto-focus which is just bad. For the gaming fans, once again, Tecno goofed. Though the 1 GB RAM can definitely hold against any game thrown at it, the offering of a 2 GB by Innjoo and Infinix is definitely a better choice. 16 GB ROM for your application and storage is gradually becoming a standard but Infinix has upped the game by introducing a variant 32 GB ROM for those who can afford the extra back. To do the math, the price difference between the two variant is 3k which is almost the same cost of getting an extra memory card (which may even turn out to be fake) so if you get the cash go for the 32 GB ROM and if you still need a memory card, you would be having a whopping 64 GB for storage. Infinix Zero 2 has a unique Kevlar textured back cover that gives you firm grip on your phone and it has a relatively lighter weight compared to others. Innjoo Fire features metallic rim that gives you that premium feel as you hold your phone. Tecno J7 offers a curve back that fits well into your hands. I would not hold your hands to buy your phone or to get your best device but I will give you some guidelines to know which is the best for you . If you are the picture and gaming freak, then the Infinix Zero 2 is what you need. If you need best quality audio for playing music and a smooth user experience, Tecno J7 Boom is the best for you. But if you want everything at an affordable price, then Innjoo Fire is the phone for you.